I’ve just got to get this out of my system. 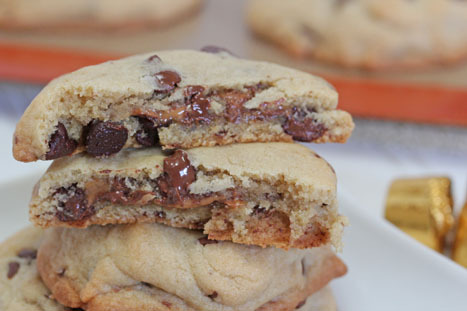 After making these, I’m really not sure that chocolate chip cookies will ever be the same again. I am not sure I’ll ever be able to make unstuffed cookies again! You have to let them cool to just the right temperature. Still a bit warm, but cool enough for the caramel to have started to harden. But only just a little bit. And if you get it at just the right time, you take a bite…and as you pull the cookie away, a long string of caramel forms and you have to catch it! It’s a moment of ooey, gooey stuffed cookie perfection. I sure hope you can recreate that moment! Oh my….. these look just amazing ! thanks Erin for the lovely pictures. I will have to try this, as long as I don’t eat all the Rolo’s before. This sounds like a great idea! I love rolos but when they’re tough to chew when they’re cold (I always worry that I will lose a crown) so this would be perfect! OMG. Too yummy looking. And to think, I was ahem I mean I am going off chocolate for two weeks. Saved by the fact that I have NO Rolos in my house. Phew. I gave up chocolate (and all sweets!) for Lent. I am soooooooo planning to make these to enjoy the day after Easter . . . Easter Day is dedicated to Cadbury Eggs alone! A great recipe for a day of delicious self-indulgence. Very nice photo. Ooh! Reminds me of a recipe I saw on a blog a few days ago. 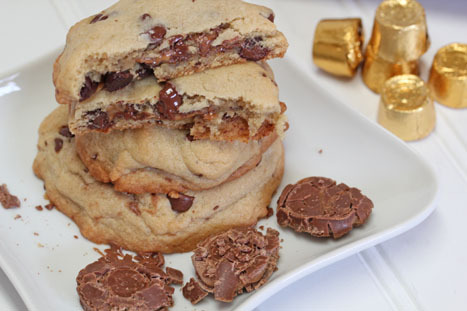 Get this: cake ball-stuffed chocolate chip cookies. Basically, any sort of dessert-stuffed dessert is a winner in my book. I made cookies stuffed with rolos as well, they were absolutely delicious! However, I did not flatten them and they turned out great. Those look good enough to sell at a markup! …Or eat. These cookies look amazing! I couldn’t wait to try them, but had no Rolo…so, I dug around to find something else to stuff them with. I had some chocolate cheesecake so I stuffed the cookies with about 1/2 tsp of that instead. Awesome!!!! Thank you for the inspiration and for the delicious recipe! So how DO you get your cookies to not spread all over the place?? I tried making these tonight, followed your directions exactly and they spread and then fell apart because they were so thin even after cooling for a bit. I just discovered your blog and I love your ideas. 🙂 I have to say, WOW! These look incredible! Bookmarking this for later… and by “later” I mean in like 15 minutes, haha. At a place called Truffle Berries in town they have these BUT they’ve had Ruffles potato chips added to them and are called PMS Cookies. Oh, they are awesome! Just now discovering your blog — so many great new recipes to try out. Rolo cookies are a holiday staple in my family. We make them in a chocolate cookie, dusted with chopped pecans and sugar. Delish. 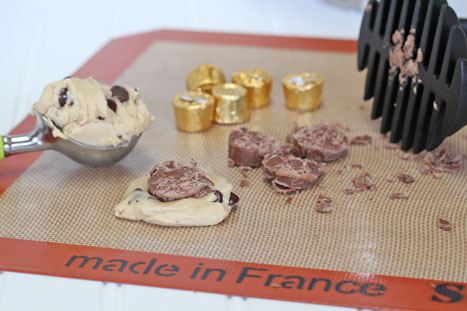 You can also just roll the unflattened Rolo into the cookie dough ball and they’ll turn out great. I gotta give these chocolate chip cookie ones a try some time soon!